We love our curries.... and this is a good meal to 'clean out' the crisper before going to market for the fresh vegetables stock-up. Any kind of vegetables will do...(may be not the leafy ones like spinach, pak choy etc). Serve with either steam rice, mantou or even roti canai. Stir fry the chopped dried prawns until fragrant. Then add in the onion. Saute until onion is soft. Stir in the curry paste and lemongrass....cook until fragrant. 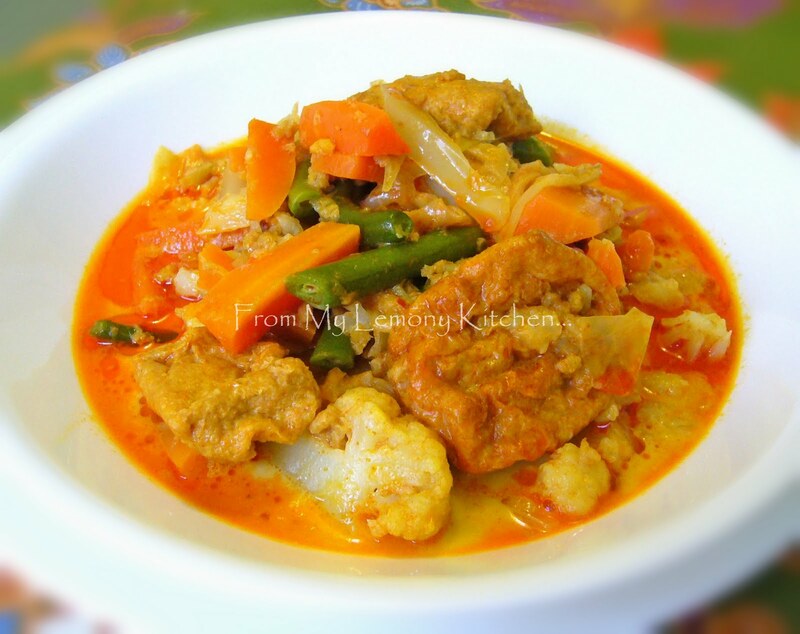 Add in carrots, cabbage and cauliflower and cook until its tender then add in the rest of vegetables with coconut milk, prawn paste (belacan) and beancurd. Season to taste.